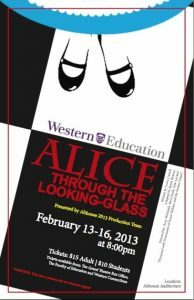 Althouse College students in London, Ontario will present James Reaney’s adaptation of Lewis Carroll’s Alice Through the Looking-Glass at Althouse College at the University of Western Ontario on February 13-16 at 8 pm. Tickets are available from the Grand Theatre Box Office, the Faculty of Education, and Western Connections. Best wishes to the Althouse 2013 Production Team for a rousing performance — see you there! Update February 14, 2013 from Susan Wallace: A wonderful show… excellent dance numbers and some fine physical comedy from the White Knight, quite hilarious. Four different Alices, showing her path to maturity as she travels to Queenhood. For more details, see JBNBlog: Just Ask Alice Through the Looking-Glass.